The Law of Attraction can help you manifest a house fast. Not just any house, but your dream house! It doesn't matter what your credit is like or what your income is. The only thing that matters is that you use the Law of Attraction in the right way. I've used the Law of Attraction to manifest a house multiple times. The first time I had a deadline for when I needed to move. It was November and I was in my final semester of college when I discovered that I needed to move over 500 miles away. I had to coordinate selling the house I was living in, finding and buying a new house, and moving to occur after final exams ended in December and before my new job started the first of January. My goal date for everything to close and for all of my things to be en route to the new house was December 19. I found a new house that matched what I was looking for by the end of November. On December 19, both the new house and the house I was selling closed. All of my things were also loaded on a moving van that day, and delivered to my new house on December 21. I've manifested two more houses since then, and have shown friends and family how to manifest houses too. 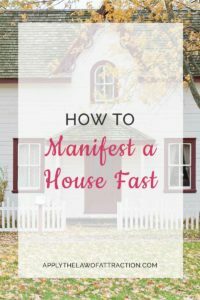 You too can use the Law of Attraction to manifest a house fast! 1. Know what you want. Make a list of everything you want your house to have: the number of bedrooms, what the neighborhood is like, how much land you have, what the kitchen is like… Anything you can think of and want, write it down. 2. Visualize your house. See yourself in your house. Notice all the things you love and appreciate about it. Tell your house how much you love it. Pretend your house is alive and tell it how wonderful it is. Tell it about you and your family. Let it know how happy you are to live in it. 3. Believe you are worth it. Release any doubts you may have. Believe in abundance and that you're entitled to your dream house. 4. Practice oneness. Be at one with your house and the person you would need to be in order to have your house. What would a person who belongs in that house do? Do those things. Simply apply those four proven Law of Attraction techniques and you can manifest a house fast. If you have a blog and want to join a group writing project for “How to…” articles, join me and others at Problogger.net. Nice blog! I am very interested in the Law of Attraction. Thanks for the article. I love what you wrote and believe 100% that I can manifest what I want and need. My fiancé and I desperately need and want a new home–here’s where I’m stuck–I don’t know what I want–and therefore can’t manifest it. I’ve lived in places where there are lots of windows and light (which I love) but don’t like that people can literally walk up to said windows and see or touch into my space. Just popped over from the comments at ProBlogger to check out your ‘How To’ – so timely for me! Thank-you so much for this. Hi Tamara – It would apply to building a house too and you’re right that the actions would be the same! Your list might include things about how smoothly the process went, how things came in under budget, etc. Your visualizations would support your this. To speed it up the manifestation, it would be best to think, visualize, and act from the end result, meaning you would see your house as already being built. You would visualize living in it, telling it how great the experience building it was, etc. You can certainly start with a smaller item first! If you think you a house is too big to start with, it’s actually best that you don’t start with it. Thinking it’s too big is a sign that you have resistance to manifesting a house and it could be quite difficult for you to manifest one until you remove the resistance. With enough practice with smaller items, you’ll also come to see that there’s no difference between manifesting something small and something big, and it’ll be easier for you to manifest a house. Hi Elizabeth, I came over here via ProBlogger’s Group Writing Challenge. I enjoyed your post and had a question about visualization…is it better to visualize something in your head and use your imagination versus, say put together a dream board on Pinterest of rooms and images that you like of various houses? Or does it not really matter as long as you are focusing strongly on your goal? Thanks! Hi Rashelle, the most important thing is to believe that you already have your house. Visualization and vision boards are tools to help you stay focused. Visualization is usually more powerful because it’s easier to get into the mindset where the house is already yours. With vision boards, there can be a tendency to see the images as a collection of things you would like or will have. So it’s important with vision boards to remember that the images are items that are yours. The bedroom is your bedroom. The kitchen is your kitchen. I LOVE your site here, I’ve spent hours browsing articles! One question I have regarding this article, and your aforementioned statement about it being of utmost importance to believe the house is already yours: I have my dream house picked out, it is literally perfect and everything I have envisioned and could want; perfect neighborhood, number of bedrooms, set up, amenities, features, style… I’m so much in the belief that it is mine, I’m basically ready to schedule a moving truck… how do i stay focused, walking the line of “this home is mine” and “this home will be mine?” Thanks!!! Nice use of storytelling but you didn’t convince me. I need more details and proof to believe the law of attraction works that easily. Good morning. It works. Every time. I have manifested money that came to me multiple times, even the exact amount that I wanted. I manifested my relationship with my boyfriend. I manifested certain types of closings. I even manifested being featured in a national magazine…and they came to me. I never reached out to them. It’s in the Bible, notable entrepreneurs , sages , academics also lived their lives like this. This is proven by science. Give it a go. You have nothing to loose, but everything to gain to live your best life. I believe that LoA can help us by letting us notice when the right opportunity knocks and giving us the selfconfidence we need to take it. My home has been for sale since March and the house I want is still available, these are fabulous tips and I do speak to a picture of my house daily, hourly. I’m obsessed with this house and selling this house, which is someone’s dream house. I’ve set the goal, I see myself there; what is going on that it isn’t happening? I’m optimistic it will, I’m just impatient. 🙂 Thanks in advance. Hmmm, I posted a comment and it manifested itself away. 🙂 Let’s try again, my house has been for-sale since March 2013, my dream house awaits me. I’ve changed realtor’s recently, and have a really good feeling about this person. I dream about this house, I see myself at this house, it’s my house as I’ve got it decorated in my mind. I have a picture, with a moving company brochure in front of my computer. I think part of why it hasn’t sold is due to rates going up, and I could have been generating negativity surrounding that. No more! That is MY house, and this will happen prior to the snow falling in Colorado. What other tips or thoughts can you give to encourage more positive energy for my house selling and me finally, after a year, getting my dream house. Thank you!!! It didn’t manifest away. 🙂 Comments are held for moderation to prevent spam. You can see your comment and my reply above. For a while back in 2011 my sisters, mother and I (I am 17) lived in the most spectacular home. It was our dream home and everything we could ever want. And we even did things like these to get it! (We just visualized a house that we wanted, and would be perfect for us, and it happened!) We all agreed it was the happiest we had ever been. But because of certain circumstances, we had to move out and have lived in two different places. One being something we all hated and visualized another place. It worked again, and it’s a pretty nice place but we all feel as if there’s something missing. As if it’s lacking in some way. We recently had a spontaneous conversation about the fantastic home with lived in for a few months. We got all giddy and happy over the thought of being able to live there again. My mother said it was for sale and that just fueled it. But I looked up the place online and it said it was since early in 2012. Not sure how my mother thought it was for sale but that’s besides the point. The point is we are doing the same thing we did before we got the amazing home even though it’s not on the market. I understand obsession and impatience is something that will prevent it from happening so I’ve told my sisters ways to avoid it and imagine us owning the place again. Focusing on the future and not the past, and to let it go to the universe as we had before. Are there anything else we could to help our desire to have our dream home again? Or should we just move on and visualize something better? We would like to move in before Fall sets in but we understand we should not be impatient. Thanks for the amazing article and I hope you can help! Hi Abigail – It’s wonderful you’ve had so much luck manifesting houses in the past and have such a clear vision now. You have given your sisters some great advice. I recommend focusing on how you would feel living in the house you want and, instead of focusing on the future, imagine as if it has already happened – as if you’re already living there. If you find you or your family start to obsess or become impatient, you might want to consider being open to experience the feelings you want in the best house for you. Allow the Universe to decide which house is the best one. You might find yourself living in an even better house than the one you used to live in. Do I try to manifest my dream house, or do I manifest money? What comes first? Thank you for your insight in advance. Hi Ruthie – You want to focus on the house, not the money. Worrying about the money is the how it’ll happen. It’s the Universe’s job to take care of the how. You never know all the different ways you could get the house, such as your husband getting a raise, find a foreclosure, etc. If you just allow the house to come to you, opportunities will open. Me and my boyfriend want to manifest a new homw , we are really broke and i’ve just recently heard of law of attraction. Please do give some tips , how do we manifest faster, easily and effortlessly? I love the positive feel of your article! I have found a home I want to live in, to me it has life and soul, I feel at peace there. I have been to see it several times now, but as getting a mortgage is proving to be near impossible for me I have decided to work closely with the Law of Attraction and manifest being able to buy it and make it home for me and my family. I really don’t know what else to do! When I first went to see it after looking at it several times on the internet real estate site, I felt instantly at peace and at home there. I am going to give it my best shot with LoA. Awesome article! I have my eye on a home in the town next to us that I love and did a search & I came across your article and SOOO happy I did! In my Home Staging work & eBook, I work with a process called Staging with Intention that incorporates Feng Shui & Law of Attraction principles for selling one’s home. I love this article because its on attracting your dream home! I bought your book and LOVED it! I have read many books on Law of Attraction and I must say yours is the BEST one I have ready – EVER!! You clearly explain everything- easily step by step. I am so impressed with this book! I would love to interview you for my podcast in the future- if interested? Again- awesome book to anyone who wants to know more about the Law of Attraction- Thanks, Elizabeth :)!! my husband is writing his first bok (this has been a long process, four years) can I use LOA to get his book published and for it to be a success. He has worked so hard I know he deserves the success.